Explaining major discrepancies between Bishop's Transcripts and Parish Registers? Bishop's transcripts were copies of parish registers that were sent periodically to the diocesan bishop. In the past I have noticed minor discrepancies between parish registers and bishop's transcripts, which are to be expected. However, in examining the parish registers and bishop's transcripts for the parish of Quinton, Gloucestershire, I noticed some major discrepancies. There is nearly nothing consistent between the two copies, apart from the curious similarity in a few names - "Thomas Denes" and "Thomas Dennis", a "Joseph Keely" and "Thos. Cooley", a "Richard Best" on both lists, though the dates are completely different. Note that for the year 1782 (also included on the image), the inconsistencies are not so bad, although there are a few entries missing. The bishop's transcript states "The above is a true Transcript of the Register of the Parish of Quinton taken the 1st Day of July 1782." What is the best explanation for the descrepancies between these registers which ought to be identical copies? Note: Both the PR and BT can viewed on Ancestry.co.uk. Due to the location of this parish near the Warwickshire border it so happens that the PRs are archived at Warwickshire Archives, thus appears under Warwickshire, England, Baptisms, Marriages, and Burials, 1535-1812, while the BTs are under Gloucestershire, England, Baptisms, Marriages and Burials, 1538-1813. The September 2015 issue of the Society of Genealogists' Magazine (p420) notes missing burials in Sussex, in the early 1800s. The problem originated from the Priest completing the register once a year from the parish clerk's account book. The problem was that no entry was made into the account book if the fee had been paid in full already. The account book was there to record money owing, not burials. Note that this exact case did not have discrepancies between PRs and BTs of the question. However, it does illustrate a possible failure mode leading to lost records of some sort. Maybe in the case of this question, there were two books in use by different people and only one was copied for the BTs. Certainly there are a number of cases where draft and final copy parish registers survive - it is logical to assume that there were once many more draft PRs. It is, however, difficult to see how this sort of set-up could cause the major discrepancies seen in the original question! Not the answer you're looking for? 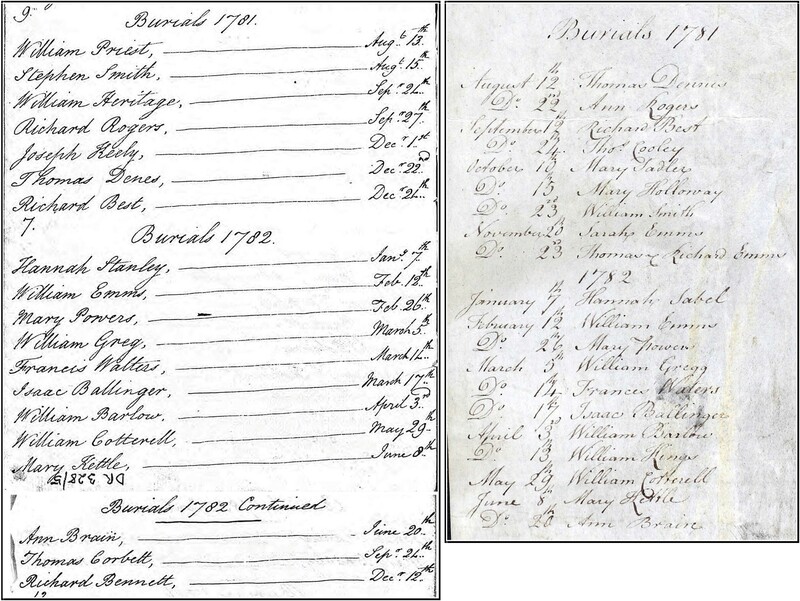 Browse other questions tagged england 18th-century parish-register gloucestershire or ask your own question. Determining maiden name of Alice who had eight children (1744-1762) with William Sellick christened at Stogumber, Somerset, without marriage record? Why would a family baptise at a parish but not marry or bury there? Why might Illogan and Gwythian parishioners marry in 1749 at Phillack, Cornwall? Interpreting “married by Licence as I am credibly informed” on 1732 Gloucestershire marriage record? Determining if FindMyPast image comes from Parish Register, Bishop's Transcript, or something else? Understanding wording of 1720 baptism at Stogumber, Somerset, England?